This article lists political parties in the Netherlands, which has a multi-party system with numerous political parties, in which any one party has little chance of gaining power alone, and parties often work with each other to form coalition governments. The Royal Netherlands Air Force, is the military aviation branch of the Netherlands Armed Forces. It was created in 1953; its ancestor, the Luchtvaartafdeling of the Dutch Army was founded in 1913. The aerobatic display team of the Royal Netherlands Air Force is the Solo Display Team. Task Force Urozgan (TFU) was Australia and the Netherlands contribution to NATO's Regional Command South, International Security Assistance Force, in Afghanistan. The Dutch lead one of the four Provincial Reconstruction Teams in the southern region of the country. 1,200 to 1,400 Dutch military, mandated by the Dutch Parliament in February 2006, will attempt to maintain order in Urozgan province through July 2010. They will also attempt to develop political and economic infrastructure and to train the Afghan police. Following the 2006 Dutch general election, held on November 22, a process of cabinet formation started, involving negotiations about which coalition partners to form a common programme of policy and to divide the posts in cabinet. On February 22, 2007 it resulted in the formation of the Fourth Balkenende cabinet. The Fourth Balkenende cabinet was the cabinet of the Netherlands from 22 February 2007 until 14 October 2010. The cabinet was formed by the political parties Christian Democratic Appeal (CDA), Labour Party (PvdA) and the Christian Union (CU) after the election of 2006. The grand coalition cabinet was a majority government in the House of Representatives. 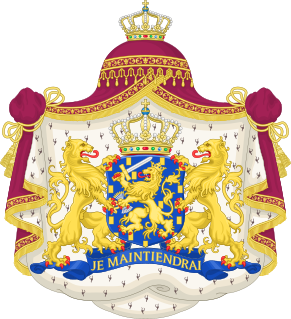 The Ministry of Defence is the Dutch Ministry responsible for the armed forces of the Netherlands and Veterans Affairs. The Ministry was created in 1813 as the "Ministry of War" and in 1928 was combined with the "Ministry of the Navy". After World War II in the ministries were separated again, in this period the Minister of War and Minister of the Navy were often the same person and the State secretary for the Navy was responsible for daily affairs of the Royal Dutch Navy. In 1959 the ministries were merged. The Ministry is headed by the Minister of Defence, currently Ank Bijleveld, assisted by a State secretary and the Chief of the Defence of the Netherlands, Rob Bauer since 2017. In January 2006, NATO's focus in southern Afghanistan was to form Provincial Reconstruction Teams with the British leading in Helmand Province and the Netherlands and Canada leading similar deployments in Orūzgān Province and Kandahar Province respectively. The United States, with 2,200 troops, stayed in control of Zabul Province. Local Taliban figures voiced opposition to the incoming force and pledged to resist it. Battlegroup 107 or BG-107 is an EU Battlegroup. It originally consisted of military elements from the Netherlands, Germany, and Finland. From 1 January 2007 until 30 June 2007, it was on standby under German leadership. In preparation for its second standby period in the first half of 2011, when it was also known as EUBG 2011/1, its composition changed; Austrian and Lithuanian troops were added, the Netherlands took over command. The Ministry of Housing, Spatial Planning and the Environment was a Dutch ministry. It was responsible for policies on public housing, spatial planning, the environment and the housing of national government agencies. It was merged with the Ministry of Transport, Public Works and Water Management into the new Ministry of Infrastructure and the Environment on 14 October 2010. Mart de Kruif MSM is a three-star general in the Royal Netherlands Army and served as its executive commander. Major Marinus Johannes "Marco" Kroon, RMWO is a Dutch officer serving with the Korps Commandotroepen. Kroon is one of only four living knights of the Military William Order and the first new member appointed to this very exclusive Dutch Order in over half a century. The Military William Order is the highest honour in the Netherlands, bestowed for "performing excellent acts of Bravery, Leadership and Loyalty in battle". Thomas Antonius "Tom" Middendorp is a retired general of the Royal Netherlands Army. He served as Chief of Defence of the Armed forces of the Netherlands from 28 June 2012 until 3 October 2017. He previously served as the Commander of Task Force Uruzgan part of the International Security Assistance Force from 2 February 2009 until 3 August 2009.